Ron Bushwell was a Guard for the UConn Huskies from 1953-1956. He’s a member of the UConn Basketball All Century Ballot, was a member of three straight Yankee Conference Championship teams, two National Collegiate Athletic Association bids, one National Invitational Tournament bid, and was an All-Yankee Conference first team pick. In July 2004, I spoke to Ron as he shared some college and post-collegiate experiences. 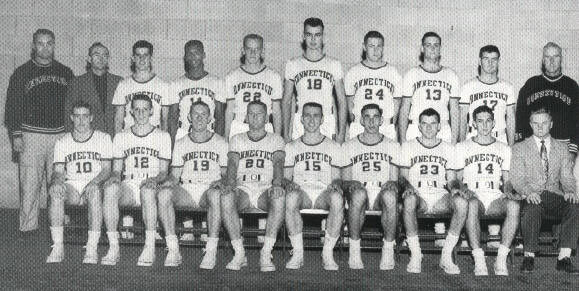 While at UConn, Ron was co-captain of the basketball team in 1956 with Gordon Ruddy. “One of the great games in the history of UConn was the first ever NIT game, at Madison Square Garden in 1955. The third game of a triple-header. The first game was Lafeyette versus Niagra. The second was Seton Hall versus St. Francis of Loretto, and the third was at 11:00 PM with 19,000 people, UConn playing St. Louis Billikens. We lost 110 – 103. It was the highest scoring game in the Garden for many, many years. Jim Ahearn and I had 50 points between us, and Art Quimby had a ton of rebounds.” Another big game was in 1954 playing Holy Cross, a powerhouse team loaded with great players. The winner would be number one in New England, and go to the NCAA. The loser went to the NIT. With five seconds left in the game, a Holy Cross player stole the ball, and went in for a lay up. UConn got the ball back, took it out at half court, and Worthy Patterson faked a shot, and drove in for a lay up, and UConn won the game 78 – 77. While Ron was at UConn, another memorable game was playing in the first game ever at the Hugh S. Greer Field House. Ron thought both the UConn men and women winning National Championships this year was superb. As for next season he thinks the men have the nucleus of a fine team coming back, and some good recruits coming in. He thinks Coach Calhoun is a master at recruiting, and will have another excellent year. Ron graduated from UConn in 1956 with a degree in Business Administration. A few weeks later he married his high school sweetheart, and joined the Marines, who he served with for three years. While in the Marines, in Japan, Ron had knee surgery and was never able to play professional basketball, but played in community leagues. After serving in the military, Ron started a career with Phoenix Mutual, selling life insurance. July, 2004 was his 44th anniversary of selling life insurance, 40 years with Phoenix Mutual where twice he led the company in sales, and 25 times was in the top ten in sales of the company. Four years ago Ron, and his sons started their own company, The Bushwell Organization where, they sell life insurance, estate planning services, and insurance for executives. Ron has been married to his wife, Rosemary, for 48 years. They have six children, Linda, Michael, Gregory, Kathleen, Brian and Mary Kay, and 14 grandchildren. His three sons own the Bushwell Organization with him, and one of his daughters might soon be working there too, another daughter works for a doctor, and another lives in Arizona and owns her own wine tasting business. Two of his daughters are marathon runners. Ron was proud to play at UConn, and told me that he thinks about it a lot even 48 years later. He said he has lots of scrapbooks from those days that he enjoys looking through, and talking to people about that basketball era.